With the Senate halting talks, all eyes are on the lower chamber of Congress to produce a deal to avoid default. The challenge is clear: will Boehner get 217 Republican votes to pass a deal to avoid default? Tonight, two members of the House, Rep. Donna Edwards (D-MD) and Rep. Steve King (R-IA) join hosts Stephanie Cutter and Newt Gingrich to debate the potential deal. 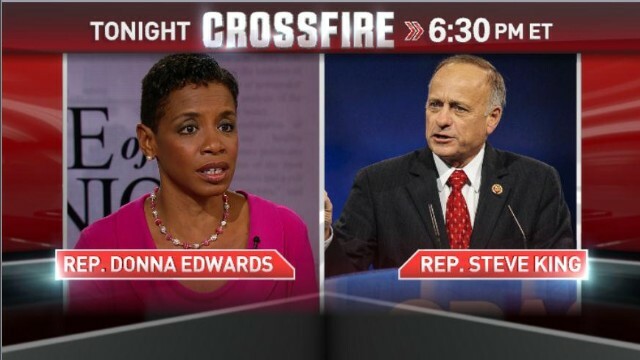 Join the conversation and tell us what you would ask Edwards and King by tweeting with #Crossfire. We want you to weigh in. If Congress funds the government for 3 months, do you think there will be another shutdown in January? Reply Yes or No now below, by replying to our tweet or by commenting on our Facebook post. They are all to blame for the governmental situation and the state of our country. They are all elected officials by the people of the us, who are all trying to do one job but have different beliefs and strategies to get the jobs done. You have to find common ground, everyone has to negotiate. Because no one wants to negotiate out of what they want in the end deal, there's not going to be anything moved because no one will go outside the box to budge. It's the highway or no way for everyone. That's BS! They have missed deadlines by a month. Who goes to work for a month and misses all deadlines? No one, because they are all fired if deadlines are not met. I think the government needs to address some policy issues and put standards and business practices into place. The exact same issue will come up January and February plus into the future under President Obama, because the only thing that will be passed is a temporary fix. Temporary does not fix anything. That's like sticking a giant piece of "Duct Tape" over the problem and eventually you really will have to do something because it's not going to be the real solution to your problems! We need a permanent fix. There has got to be long term permanent solutions to the country's escalating debt. The solution is to stop borrowing if you can't control spending. While your not borrowing eliminate all unnecessary spending, and reform all programs. Delete out the outdated, stop all concessions, stop all special interests, cut waste fraud, and abuse in every program that is federally run. What the federal government is paying for, make sure that it's a necessity and no nonessential. You are the reason the government is such a financial mess, because you allowing it to happen, year after year, after year and in the past 5 years we have had to worst debt problems ever. We can't keep running a government and a country, not knowing how or when we can pay the bills. That's ridiculous! You can't run a household like that, you can't run a business like that. It doesn't work that way. I feel it's a shame for our country, the way we are running our government. What in the world the president of the US was doing making peanut butter and jelly sandwiches, is absurd. He is not in a volunteer positions. He's on company time and getting paid. The people he was working with were volunteering because they are on furlough, he's not! Maybe he needs to be if he doesn't feel it's important enough to be negotiating with the other elected officials in our government. That's the problem because everyone has to negotiate, whether you like it or not. Every side gets a say, when ones not talking the other side talks while the other side listens. This is how you meet and come to common grounds, everyone has to be at the table, one does not need to be at another table making peanut butter and jelly sandwiches off in the distance. The leader of our country needs to lead. I love crossfire but you can see that you have slapped newt down, let him go let him be newt. Your show will be just another obama side show. Don't make it another chreeleader for obama show. Many of the people i know are starting to see this. You know history will tell you to be wary of people(tea party) demanding drastic change. The Nazi and Communists had less than 7% population involved and agreeing with them! BEWARE when a small number of people can convince the majority they are one wrong!!!!!! Why is no one talking about Greece or the other European countries in a similar financial crisis (Spain, Italy, France, Portugal, Ireland) due in part to the fact that they failed to deal with the hard issues related to their growing debt – too much socialism? We should be learning from what they did wrong and try to avoid the same mistakes. Although crazy austerity at this point would hurt our economy, we at least need to start having difficult conversations and making difficult decisions instead of passing the buck down the road. Despite what our politicians are telling us, we can't have everything without at some point in time "paying the piper". The questions is, when do we as Americans decide that we are willing to make the difficult decisions and take a hit? The longer we wait, the harder the hit. We need to remove most of the Republicans from office a start over. I pay my taxes lets get this over with. I enjoy watching Stephanie Cutter. She articulates the left very intelligently. I do not see too many people on the right that measure up to her. No wonder you love her. She never stops taking so no one else can give another opinion. Her persona reflects the personality of a person that thinks she knows it all and shows how mean spirited she is. Stephanie Cutter is awesome! I would like to see her debate Sean Hannity. She would eat his lunch in a nanosecond. The President did not create the debt nor deficit that Steve King is fighting against. A Republican House, Senate and President ran up the bills and the debt on credit card and handed the new President a 1.5 trillion dollar deficit in 2009. Those are facts, not blame, not debatable, they are historical facts. That money is already spent by the same Congress that now does not want to pay the bill. Not once did these republicans want to shut down the government nor default when they had the Presidency and they voted to increase the debt and deficit year after year. Those are facts. President Obama had not spent more, in fact, the last 5 years has seen the deficit reduced from 1.5 trillion to about 600 billion. The Republicans are fighting with the administration that reduced deficit but voted with the administration that increased the deficit every year for 8 years. Those are facts. This is not about debt or deficit, this is about personal politics and the real facts and history prove it. Please force them to admit that they spent the money, not the President and that they did nothing about spending when they controlled all branches from 2001 rto 20007. You're right...he didn't create the debt.... but he's doubled what he was given. He hasn't fixed anything and he lied to us about the ACA. He's a POS. The debt was 10 trillion when Pres Obama took office, it is now 17 Trillion. Pres Obama has outspent every President in history combined. Where are you getting the 1.5 Trillion from? The US can pay it's debt and it would be illegal not to pay it's debt, however that is what we must pay 1st so we will never be in default. Also, it is a world wide embarrassment that we, the US, even are borrowing money. IF we are the greatest, then we SHOULD NEVER need to borrow money. You are right we should not have to borrow money. if we taxed the 1% a reasonable rate we could get out of debt. Just look at California climbing out of their republican caused mess. A modest tax increase and modest spending cuts. Duh it ain't rocket science. Oh sorry NASA is shut down so we can't do that either.